If you have the funds and there’s someone in your life you really loves reading book, the ultra high-end Kindle Oasis is obviously as good as it gets. 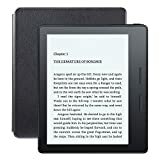 This premium Kindle model features a design and build quality the likes of which have never before been seen on an eReader. It’s also the thinnest and lightest Kindle Amazon has ever built, despite also having the longest battery life — the included leather charging cover can add months of usage time between charges. Finally, this sleek eBook reader includes free 3G for life, so you can download new books no matter where you are. With Mother’s Day right around the corner, Amazon has just discounted the Kindle Oasis for the first time ever. Between now and the end of the day on Saturday, May 13, you’ll save $50 on a Kindle Oasis, and that includes a leather cover in your choice of color (black, merlot, and walnut). If you’re looking for the perfect gift for your mom or yourself, look no further.